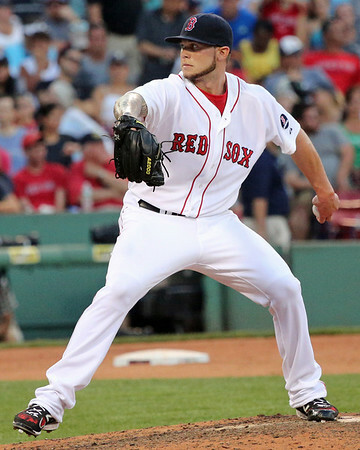 The Red Sox have designated left-handed pitcher Drake Britton for assignment, the team announced Friday. A move was necessary to open a spot on the 40-man roster to sign free agent pitcher Alexi Ogando. Britton, 25, is out of options, leading to his precarious roster situation. With the additions of Ogando and Robbie Ross this week, open slots in the major league bullpen appear limited. Britton pitched well out of the major league bullpen down the stretch in 2013, posting a 3.86 ERA and striking out 17 in 21 innings. A starter throughout his minor league career, 2014 was the first time Britton went through the offseason preparing to work out of the bullpen. Unfortunately he was unable to build on the success of the previous season, struggling mightily in Triple-A Pawtucket. In 45 appearances, Britton had a 5.86 ERA, and walked 38 batters against only 37 strikeouts. Tuesday night, the Red Sox announced the trade of right-hander Anthony Ranaudo (pictured) to the Texas Rangers for left-hander Robbie Ross. Similar to the Wade Miley trade the Red Sox dealt from a position of depth, with the surplus of arms they have built up in the upper minors. In Ross, the Red Sox acquire a player with a longer big league track record than Ranaudo and someone who has been successful out of a bullpen role, with plus velocity from the left side. Ranaudo was a supplemental first-round pick in 2010 after a disappointing junior season at LSU. Ranaudo entered the season as a potential top-five pick, but suffered through a combination of injuries and poor performance. After the draft, he pitched in the Cape Cod League and excelled, striking out 31 and walking eight in 29 1/3 scoreless innings. He signed just before the midnight signing deadline on August 16 for a $2.55 million bonus, the highest given by the organization that year and one of the ten-highest bonuses given out to any pick. With the Red Sox he has progressed steadily, but he has not developed into the potential ace he once seemed he could become, now projecting as either a number five starter or reliever. Red Sox deal Anthony Ranaudo to Rangers for Robbie Ross Jr. 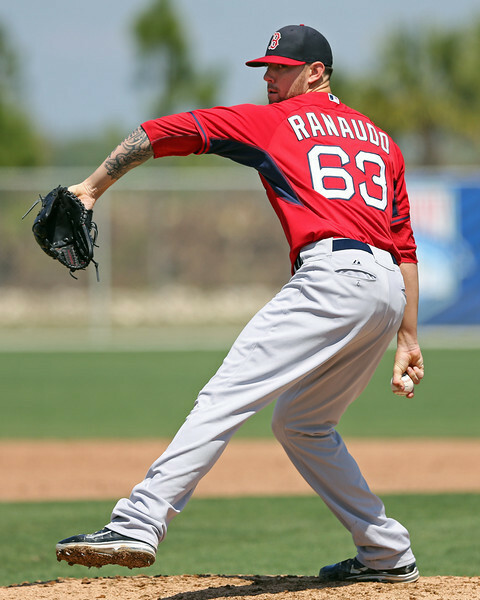 The Red Sox have announced the trade of right-hander Anthony Ranaudo (pictured) to the Texas Rangers in exchange for lefty Robbie Ross, Jr.
Ranaudo made his major league debut last season for the Red Sox after the club dealt away four of their starters at the trade deadline. In seven starts, Ranaudo, 25, went 4-3 with a 4.81 ERA and 1.39 WHIP. Originally drafted by the Rangers in the 11th round of the 2007 draft, Ranaudo did not sign and was later drafted 39th overall in the 2010 draft by the Red Sox after three years at Louisiana State. Ranaudo enjoyed a breakout season in 2013 when he posted a 2.96 ERA over 140 innings between Double-A and Triple-A. 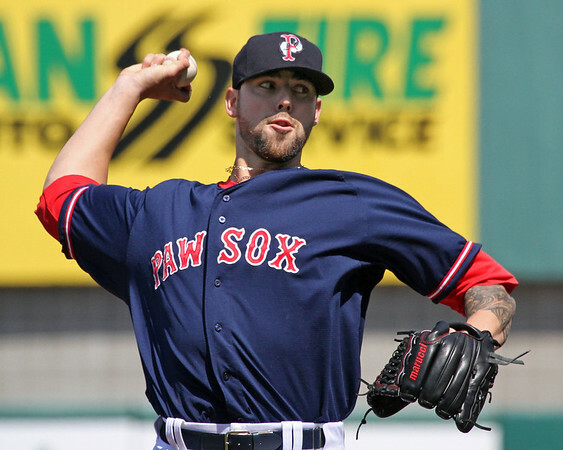 In his first full season with the PawSox in 2014, Ranaudo went 14-4 with a 2.61 ERA and 1.20 WHIP. This week's fall/winter league roundup covers play from the period of January 19-25, a light week with very little Red Sox activity. For the full list of Red Sox players who participated in offseason action, check out our Fall and Winter Leagues page. Note that this will be the last roundup of the offseason. You will be able to find further winter ball updates in our regular offseason notes columns. Perth won nine of its last 11 games, and earned a spot in the Preliminary Final, where they will play Sydney in a best-of-three series starting this Friday, January 30. 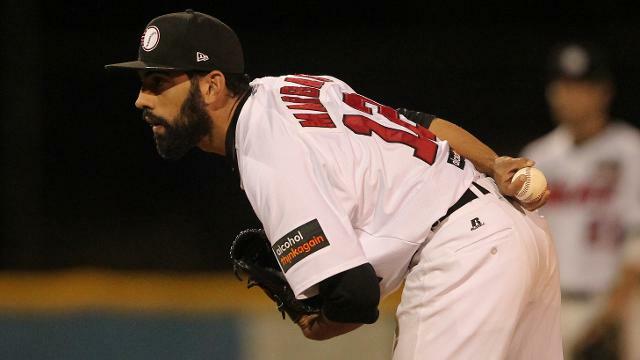 The winner will take on Adelaide in the ABL Championship Series, which will stream on ESPN from February 6-8. CAMBRIDGE, Mass. 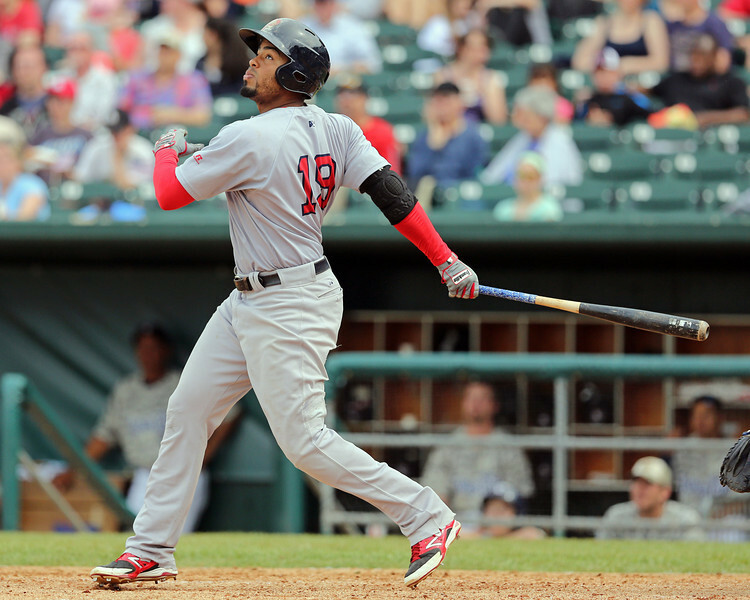 -- After missing more than half of the 2014 season with a leg injury, Henry Ramos (pictured) is “physically healthy” after playing winter ball in Puerto Rico this offseason, according to Director of Player Development Ben Crockett, who spoke about Ramos at the Red Sox Rookie Development Program last week. “Just from what we’ve seen here, he’s been running well with Mookie [Betts] and Rusney [Castillo] and Sean Coyle, right up at the front of the pack with those guys every day,” Crockett said of Ramos. Ramos fouled a ball off of his leg and left the game on May 28 last season, subsequently being diagnosed with a stress fracture in his left tibia. He would miss the remainder of the season. After rehabbing the injury, the 22-year-old played 32 games in winter ball in his native Puerto Rico this winter. Understandably rusty, he posted a .217/.317/.264 line. CAMBRIDGE, Mass. 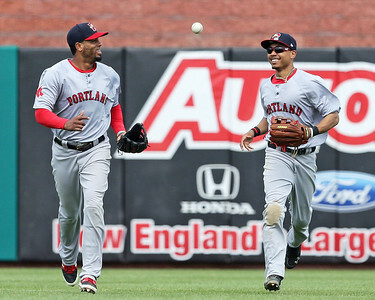 -- The acquisition of Hanley Ramirez, the return of Shane Victorino, and the arrival of Rusney Castillo at the end of the 2014 season have made the Red Sox outfield a crowded place. With so many moving pieces, it remains to be seen just where Mookie Betts, fresh off a year in which he proved his ability to succeed at the major league level, fits. 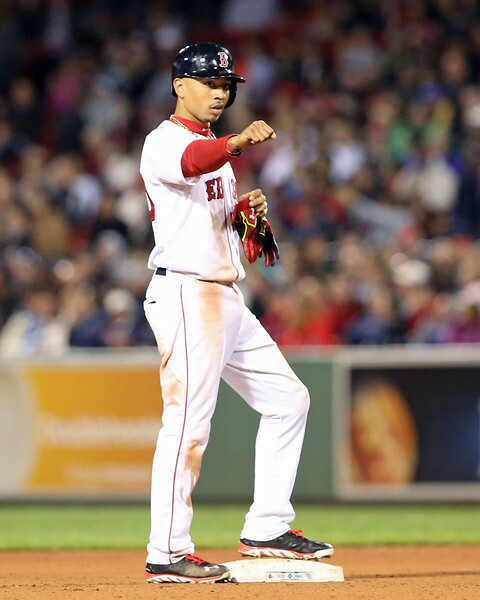 “I just know [that] I want to be in the lineup, that’s my main focus right now,” Betts said last week while attending the Red Sox Rookie Development Program at Harvard University. While it would be understandable if the 22-year-old wanted to know for certain where his place is in a still-crowded outfield picture that also includes Daniel Nava, Allen Craig, and Jackie Bradley Jr. in addition to the three aforementioned players, Betts is focusing his attention on the things he can control rather than worrying about the uncertainty of what lies ahead. CAMBRIDGE, Mass. 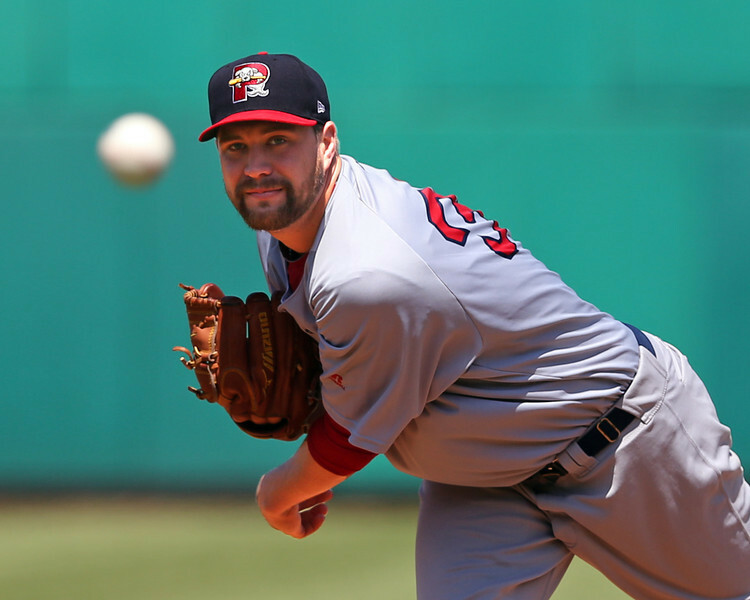 -- Coming off of his best professional season to date, a year in which he posted a 1.75 ERA in 118 Double-A innings en route to being named the Red Sox Minor League Pitcher of the Year, Brian Johnson is getting a jump start on the follow-up to his breakout year. The big left-hander was one of the ten players to attend the Red Sox Rookie Development Program last week. The 24-year-old emerged as one of the organization’s top prospects after his 2014 campaign, but within the Red Sox organization, Johnson’s success was far from a surprise. This week's roundup covers play from the period of January 12-19, a light week with very little Red Sox activity. For the full list of Red Sox players participating in offseason action, check out our Fall and Winter Leagues page, which will be updated continuously through the end of the offseason. Jemile Weeks (pictured, right) appeared in four games, going 4 for 16 with two doubles, and a run scored. Mayaguez advanced to the Puerto Rican Championship against Santurce with an 8-5 record in the round robin playoffs. CAMBRIDGE, Mass. -- Every offseason, the Red Sox hold a week-long program designed to help transition a number of players who are on the cusp of the major leagues. The 2015 Rookie Development Program took place at Harvard Stadium this past week. Ten players were chosen to attend the camp, including outfielders Rusney Castillo, Mookie Betts (pictured), catcher Blake Swihart, left-hander Brian Johnson, infielder Sean Coyle and outfielder Henry Ramos. Also chosen were pitchers Edwin Escobar, Heath Hembree and Eduardo Rodriguez, all of whom were acquired at the trading deadline in 2014. The newest member of the organization to attend was right-hander Zeke Spruill, who was traded to the Red Sox from Arizona in December. The program addresses all facets of life in the major leagues. The day generally consisted of workouts every morning, focused on fundamentals and conditioning. The players also learned about life both on and off the field through a number of seminars and guest speakers, including the likes of manager John Farrell, general manager Ben Cherington, major league coaches and players, as well as speakers from the Red Sox’ mental skills and medical departments. The program also includes community work, such as visiting Jimmy Fund patients and painting murals with members of the Red Sox Scholars program. As is usually the case in mid-January, the minor league rosters and organizational depth have begun to take shape. 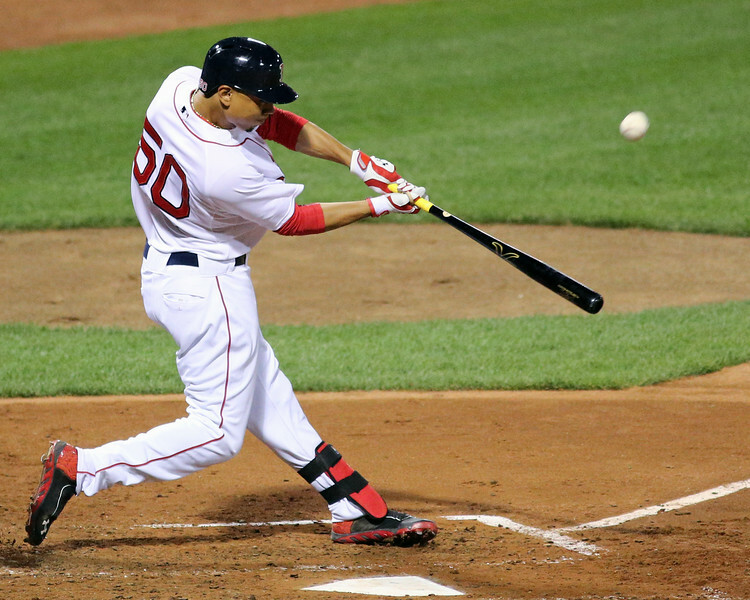 The Red Sox were involved in a number of transactions in the first half of the month. In what was certainly the most bittersweet move of the month, Boston dealt catcher Dan Butler to the Washington Nationals in exchange for left-handed pitcher Danny Rosenbaum. Of the 12 players who made their major league debut in a Red Sox uniform last season, Butler was by far the most unlikely. The backup catcher at the University of Arizona, Boston signed him as an undrafted free agent shortly after the 2009 draft. Butler ended up playing in over 500 games with the organization, playing his first major league game on August 10 last year. Tim Britton of the Providence Journal gave a wonderful look at Butler's rise back in August. Rosenbaum, a ground-ball inducing starter during his time with the Nats, underwent Tommy John surgery in May and resumed throwing in November. He is not on the 40-man roster and will be a minor league free agent after this season. 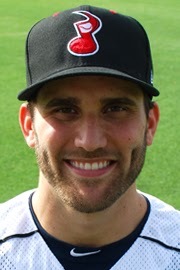 Infielder Jeff Bianchi (pictured) was signed to a minor league deal with an invitation to spring training on December 31. Bianchi appeared in 162 major league games over the last three seasons with Milwaukee, seeing most of his playing time at third base and shortstop. In 402 plate appearances, he has hit .216/.251/.283. The 28-year-old has hit much better during his stints at Triple-A Nashville, with a solid .299/.349/.428 line. Mitchell Boggs was also brought in with a spring training invite. A right-hander, Boggs (no relation to Red Sox legend Wade Boggs) played a key role out of the bullpen for the Cardinals World Series-winning squad in 2011, but is coming off two consecutive disastrous seasons. Coming out of spring training in 2013 with the Cards' closer job, Boggs posted an 11.05 ERA in 18 appearances, walking more than a batter per inning. Boston has acquired left-handed pitcher Danny Rosenbaum from the Washington Nationals in exchange for catcher Dan Butler. Butler had been designated for assignment last week. Rosenbaum is not currently on the 40-man roster, giving the team additional flexibility. He appeared in only four games in 2014 before suffering an injury to the UCL in his throwing elbow that required Tommy John surgery. The news was first reported by Nick Cafardo of The Boston Globe on Twitter. Rosenbaum, 27, was originally selected by Washington in the 22nd round of the 2009 draft. 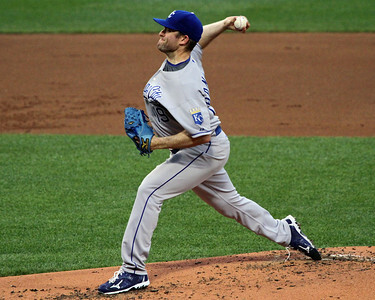 The former Xavier Musketeer moved quickly through the low minors, reaching Double-A by 2011. Following the 2012 season he was selected by Colorado in the Rule 5 draft, but failed to make the team out of spring training and was returned to the Nationals before opening day. Rosenbaum went on to have a solid but unspectacular 2013 with Triple-A Syracuse, posting a 3.87 ERA and 1.478 WHIP in 158 1/3 innings. He returned to Syracuse to begin 2014 but underwent surgery in early May, ending his season. Per Chase Hughes at CSNWashington, Rosenbaum was cleared to begin a throwing program in November. The Red Sox officially announced a number of front office personnel moves on Tuesday, some which had been reported earlier this offseason. The highlights included notable promotions from within, the creation of a new Behavioral Health Program, and the hiring of a few well-known names from outside the organization. One of the most notable moves, which had first been reported back in November, is the promotion of Raquel Ferreira to Vice President of Baseball Operations. Ferreira is just the third woman to hold the title of vice president for a Major League Baseball organization. Ferreira most recently served as the organization’s senior director of minor-league operations, a role she held for the last three seasons. Ferreira is a Rhode Island native who graduated from the University of Rhode Island, and has worked with the Red Sox for the last 16 years. For more on Ferreira, be sure to check out friend of the site Alex Speier's excellent podcast focusing on her role in the organization. Also officially announced were the promotions of Amiel Sawdaye and Mike Rikard to Vice President of Amateur and International Scouting and Director of Amateur Scouting, respectively. For more on these promotions, check out James Dunne's report from this past November. This week's roundup covers play from the period of January 5-11. For the full list of Red Sox prospects participating in offseason action, check out our Fall and Winter Leagues page, which will be updated continuously through the end of the offseason. As the playoffs began, the last two Red Sox prospects in action squared off against each other all week as Caguas faced Mayaguez. According to WEEI. 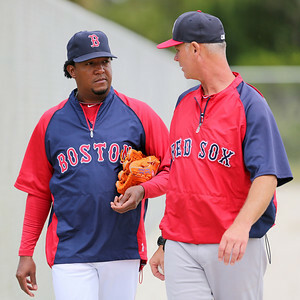 com's Rob Bradford, the Red Sox have invited ten players to the annual Rookie Development Program beginning next week. The invitees will be pitchers Heath Hembree, Edwin Escobar, Eduardo Rodriguez, Zeke Spruill, and Brian Johnson, second baseman Sean Coyle, catcher Blake Swihart, and outfielders Rusney Castillo, Henry Ramos (pictured, left), and Mookie Betts (pictured, right). Boles returns to the PawSox bench after leading the team to the 2014 Governor's Cup Championship in his first year with the team. 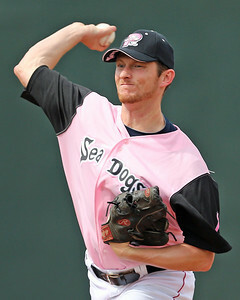 Prior to managing in Pawtucket, Boles spent three years leading the Portland Sea Dogs, and he had brief stints in Greenville and Salem prior to that. The 39-year-old's career managerial record is 876-851 over 14 seasons, including a 79-65 record with the PawSox last year. On Monday, the Red Sox made the re-signing of left-handed reliever Craig Breslow official. In order to make room for Breslow on the 40-man roster, Boston designated catcher Dan Butler (pictured) for assignment. They now have seven days to place Butler on waivers and 10 days to trade him, release him, or outright him to the minor leagues. Butler is widely well-regarded in the organization for his abilities behind the plate, and seen by some as having the ceiling of a backup at the major league level. 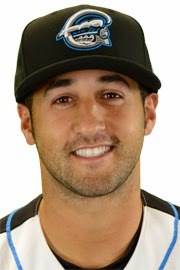 He has been in the Red Sox organization since July 2009, when he signed as an undrafted free agent out of the University of Arizona after being named a Cape Cod League all-star. He has steadily worked his way through the system since, occasionally being asked to jump several levels as a temporary injury replacement. Former Red Sox top prospect Will Middlebrooks (pictured) was traded earlier this month for catcher Ryan Hanigan, and staff writer James Dunne went into his history as Red Sox prospect. On December 17, the Red Sox acquired right-handed reliever Anthony Varvaro, sending Aaron Kurcz to Atlanta. Dunne also has that trade summary with information on both players. The fall/winter league updates keep rolling out, and the second half of this month had updates from the weeks of December 15-21, December 22-28, and December 29 - January 4. Check out the Fall-Winter stats page for the numbers on every Red Sox player participating in fall and winter leagues. This week's roundup covers play from the period of December 29 - January 4. For the full list of Red Sox prospects participating in offseason action, check out our Fall and Winter Leagues page, which will be updated continuously through the end of the offseason. The regular season wrapped up last week, and with Lara and Margarita failing to qualify for the playoffs, it is unlikely any Red Sox will see action the rest of the way. Edwin Escobar tossed a scoreless inning on Monday in his last regular season appearance, and Mario Martinez went 1 for 2 with a home run and a walk in his only game this week. With the regular season ending on December 31, Christian Vazquez (pictured) and Joseph Monge saw their seasons come to an end when San Juan missed the playoffs. Vazquez went 1 for 5 in two games this week, while Monge went 0 for 4 with a walk.